Which Attractions are found at Union Station? Union Station is the Transit Hub in Denver since 1880. It was built to make commerce able to be transported in this once dusty frontier town. Now that it’s been a century since it was built, city leaders had to decide whether or not to keep up this historical landmark and replace it with new shopping opportunities but fortunately that wasn’t the case. Today, it’s a landmark that everyone goes to for transportation, shopping, lodging, dining and entertainment. Denver is very fortunate that city leaders were able to find a way to keep this century old structure alive while incorporating modern day amenities. Here is a look at the attractions found at Union Station. 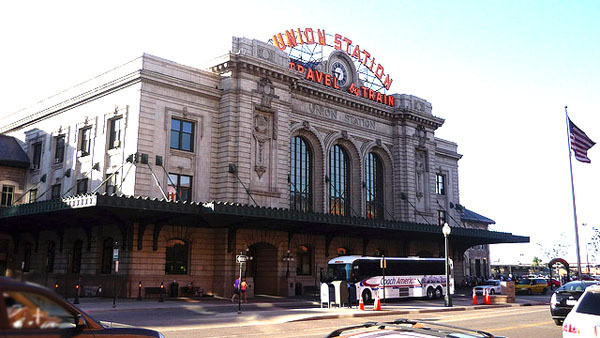 Union Station is one of the most utilized hubs for Denver transit including bus service, light rail and Amtrak service. It’s a beautifully designed building with the memorable sweeping white canopy similar to the Denver International Airport’s design. In 2016, it will also feature a commuter rail with service to the airport and Union Station should handle 100,000 passengers per day. Thanks to the renovations in July 2014, the Union Station is now a shopping and dining destination. It has great local shops and restaurants that make it a great place to hang out outside of travel. It was designed to look like “Denver’s living room” according to Colorado Governor John Hickenlooper. The Terminal Building is comfortable with couches and tables and features sit-down restaurants like Snooze, an A.M. Eatery, The Kitchen Next Door and Stoic & Genuine. Find shops like Bloom by Anushka and Tattered Cover Bookstore. Another great feature with Union Station is the lodging available. The Crawford Hotel was named after local preservationist Dana Crawford and is found on the second through fourth floors of the building. It features 112 rooms, lofts and suites as well as rooms overlooking the train tracks and soundproof windows and walls. You’ll see historic artifacts spread throughout the hotel. These are the main attractions at the Union Station. Which Swimming Pools are Found Near Littleton, CO? Which Spas are the Best in Boulder?